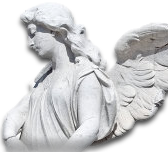 The Danbury Cemetery Association was created in November of 1850 as a result of a State law regarding cemeteries. The shares were $25 a share and there were 60 original shareholders. The first officers were Frederick S. Wildman, President; Lucius P. Hoyt, Secretary; with 6 Directors: Edgar S. Tweedy, George W. Ives, Nelson L. White, S. A. Hurlburt, Henry Benedict, and Samuel C. Wildman. The first land was purchased in December of 1850. It consisted of 16 acres purchased from William H. Clark for $300 and another 51/4 acres from Colonel E. Moss White for $80. 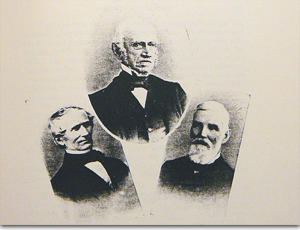 Later in November of 1867 the association purchased 35 more acres at $35 per acre from William Agustus White. And so the journey began that brought us to the present cemetery of rolling hills and diverse landscapes, hosting a variety of religions and international ethnicity. It has also become a natural habitat fostering an array of animals and birds creating an ecological friendly "green area." 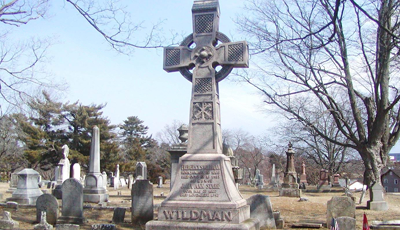 At the last meeting of the board, on the day preceding the beginning of Frederick Wildman's fatal illness" Wildman prepared with his own hand the resolution providing for the erection in the cemetery grounds of a building as a memorial to George W. Ives and Edgar S.Tweedy. 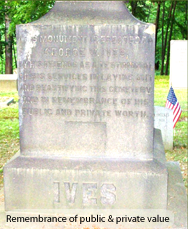 The board decided It is most fitting and proper, in recognition of Wildman's devotion and services to Wooster Cemetery, that his name should be inscribed with Ives & Tweedy, upon the memorial tablet to be placed upon this building, and that the memory of these three, who were closely united in life by the ties of sincere friendship". In 1896, the Cemetery Assoc. completed this Memorial Chapel. It is Pompeian brick, with interior wood finishing, and a slate tile roof. 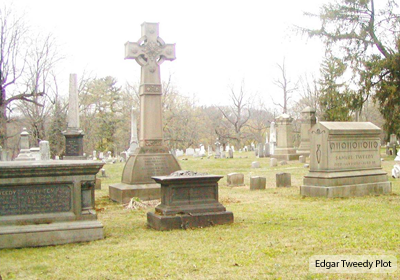 There is a bronze plaque naming George W. Ives, Edgar S. Tweedy, and Frederick S. Wildman as the 3 citizens who created and nurtured this quiet setting of eternal rest. In 1866 stone columns were erected at the entrance. Organizer of Danbury Gas Light Co.
CT Treasurer from Danbury, R 1857-581 yr. Partner hat manufacturers Hoyt, Tweedy & Co.